We have our Christmas tree set up. But for the first time in my life, it's a fake one. We both kinda hated going this route, but there was a very good reason for our decision: Don's allergies. My dear spouse loves Christmas as much as the rest of us, and we agreed it was worth getting a fake tree so he wouldn't have to walk around with severe sinus issues from having a real tree in the house for a month. He should be able to enjoy this season of worship and festivities without suffering. We thought about getting a fake tree last year after Christmas. We did some online research and were appalled both at the prices and at the utterly ugly possibilities (Fluorescent PINK trees? Really?). Prices ranged from $150 for some really chintzy options up through $400 and $500 for better ones. Ouch. But a couple weeks ago, when we were ready to buy, the model was long gone, across multiple stores. ...and prices were high. Nope. Allergies or not, a real tree was looking more and more likely. Then Younger Daughter and I made another stop at a WalMart to look at what was available, and came across a reasonably-looking model for the much better price of $90. Not terribly "realistic," but hey, if Charlie Brown could make a branch look decent, so could we. It's our first time with an artificial tree, so we aren't used to the severely perfect symmetry, but it's handsome enough -- especially for $90. Then we hauled down the decorations, put on Christmas music, and got to work. We missed Older Daughter terribly at this time, but still had fun. The results were just lovely. It seems strange to take a tree out of a box rather than cut it in the woods, but I'm glad Don's sinuses won't be acting up with having a live tree in the house for a month. Because of the allergy problem I have, my daughter grew up with artificial trees. Years later when she and her family were to spend Christmas at their own home they got a "real" tree only to find that one of their daughters had inherited my allergy and spent a sniffly Christmas. Back to the artificial trees. They don't have a lot of personality but will pass inspection with enough ornaments. You might have been able to find one at a flea market. Gosh, I can't believe the way prices have gone up. We have a little 4 foot artificial. Not only will your hubby feel better, you are leaving a tree to help create oxygen, and this tree can be reused for many years! It looks great. Have a blessed Sunday and Merry Christmas. It looks beautiful! Merry Christmas to you & your family! Looks great! We have an artificial one for the same reason - allergies. As the sufferer of numerous allergies, I feel your husband's pain. 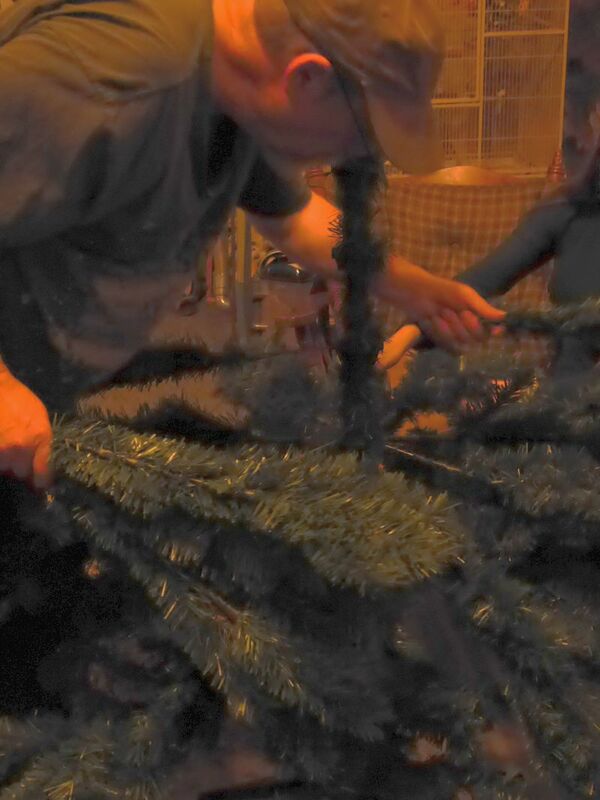 At least now you can have a tree without sinus meds, and it was a one-time expenditure! Oh thank heavens it's green! When I saw the pink one I thought it would take all my self control to not make a sarcastic comment about the color!! I have bad memories of the aluminum trees which were all the rage in the 60s... ugh. We have a real tree this year, one went down in the storm last week and so we took off the top ten feet. A real Charlie Brown tree but I don't care, just glad to make use of a dead-fall rather than taking one down. It's our first Christmas here in North Idaho. Nice reason to celebrate. Welcome to the area. Quite a few of my friends now have multiple trees. I guess if I had multiplying decoration spirit, pink might be an option. One friend said tonight that her boss' house has 10 while another friend admitted she three and another close friend of mine regularly puts up five. One husband friend of mine joked about the truckloads of boxes he gets from the storage/barn each Christmas season. They're not all his wife's though as a good many of the boxes are his outdoor set ups. 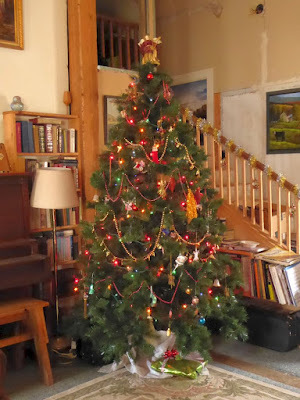 For years we put our artificial tree up in a corner and propped two mirrors up against the walls making up the angle. Really made the tree look full and the lights just sparkle. oh how I wish you lived close to me I had a beautiful 8ft tree that needed a home. Gave it away 2 days ago. Thank you for not buying that ugly pink tree LOL!!! We recently bought our second artificial tree in 16 years. I didn't realize how much dust accumulated on it and that is my allergy problem. I'm planning on yearly spraying the tree with canned air before we take it down, hoping that will take care of the dust. Merry Christmas and God bless! We switched after having real for over thirty years and allergies was one of the top reasons. After it is decorated they all look pretty, real or fake. Yours looks very nice I think!